A group of reality show contestants on a tropical island are stalked and attacked by a tribe of degenerate, ape-like cryptids. One of the characters, Troy, is from Brackard’s Point, New York, and mentions his brother Sherm, who died in a botched bank robbery in Pennsylvania. Unbeknownst to most, one of the contestants is a member of the Sons of the Constitution and plans to kill most of the crew and contestants. The Globe Corporation is mentioned to have an oil platform somewhere near the island. The cryptids’ cave contains a statue of a creature with a human body but the head of a squid. The walls are decorated with drawings of a labyrinth with a great, black, red-eyed mass in the center, creatures with human bodies but the heads of swine, and a towering creature like a cross between a gorilla and a cat. Brackard’s Point, New York is the setting of much of horror author Geoff Cooper’s work. Sherm and the bank robbery are from Keene’s novel Terminal. The Sons of the Constitution are a right-wing terrorist militia group that recurs throughout Keene’s work, such as in the story “Full of It.” The Globe Corporation is another recurring element of Keene’s fictional multiverse (Dead Sea, “Scratch,” etc.) The squid monster is Keene’s Leviathan, one of the Thirteen, as seen in the alternate realities of the Earthworm Gods books and Clickers III: Dagon Rising. 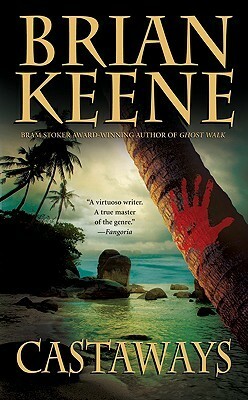 The Labyrinth is an extradimensional realm that connects all of Keene’s various works, seen best in the short story “Tequila’s Sunrise” and A Gathering of Crows. The black mass in the center of it is Nodens, greatest among the Thirteen, from Ghost Walk and Darkness at the Edge of Town. The swine-things are from William Hope Hodgson’s novel The House on the Borderland. The gorilla-cat creature is Meeble, another of the Thirteen, who plays a major role in “Tequila’s Sunrise” and A Gathering of Crows. When I read about the statue with a human body and a squid head, I thought it was Cthulhu. I was able to guess about the swine-things, though.